(Nanowerk News) PI (Physik Instrumente) LP, known industry-wide for precision motion components, systems, and solutions, announces a new OEM driver for miniaturized piezo inertia positioning stages. Applications include precision opto-mechanical alignment, bio-medical instrumentation, photonics alignment automation, microscopy, micro-manipulation. 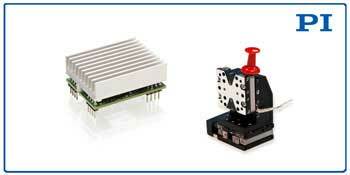 *NEW* OEM driver, shown with Q-522 multi-axis miniature positioning stage. The new E-872 driver is designed to complement the size of the ultra-compact inertia motor positioners it manages. Control is simple with step and direction input via TTL signals. The high 20kHz full step frequency delivers fast response. A version with 256 micro steps allow for extremely smooth motion with nanometer resolution. With its low current consumption and affordable price, the E-872 won’t drain your power source or your budget. With a long track record of working with OEMs in the most demanding industries from Semiconductor Technology to Medical Design – industries where product performance, quality, and the ability to ramp up, are critical, PI offers a quick path to a solution based on 1,000s of COTS products or a fully customized design. See examples of PI’s OEM capabilities here.